What are you doing this coming Thursday? If you are in London, come to a party! 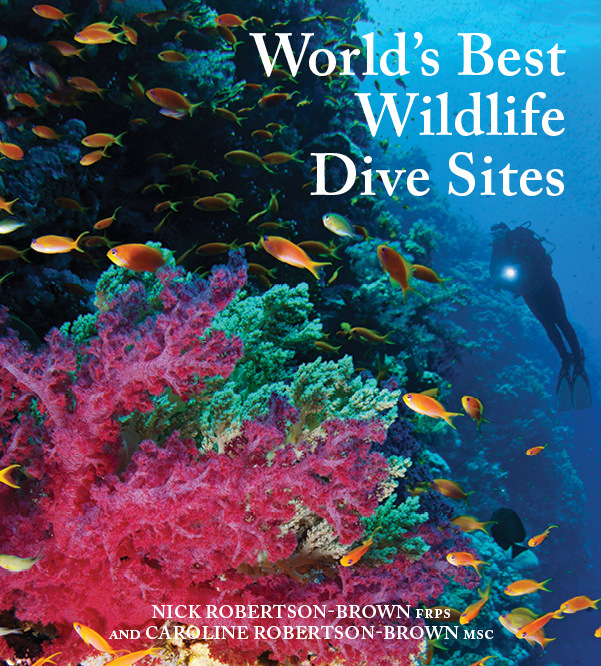 Reed New Holland are publishing a new book in August entitled "World's Best Wildlife Dive Sites". This hardback coffee table book covers 32 underwater wildlife experiences from around the world and has been authored by a Brit husband and wife team. Underwater photographers - Nick and Caroline Robertson-Brown - have degrees in biology. Handy knowledge when it comes to shooting marine life. "Over the years we have been fortunate enough to have some incredible encounters with all creatures great and small stated Caroline Robertson-Brown. "From Leafy Seadragons (Phycodurus eques) and Nudibranchs, through to walls of Bohar Snapper (Lutjanus bohar) and of course Whale Sharks (Rhincodon typus). Like most divers out there, we are ardent supporters of marine conservation. So when we were asked to write a diver's 'wish list' of best wildlife dive sites, it was a tough challenge. What do we leave out of this book? Our blue planet is two-thirds ocean. There is so much to explore out there! This 'World's Best Wildlife Dive Sites' book has stories from each continent accompanied by some rather luscious images. It is good to see that a mix of warm blue and cold green temperate waters are covered. Three UK jewels are featured. Basking Sharks off the Isle of Man, Blue Sharks in Cornwall, and of course the mischievous, "oh so innocent, no it wasn't me" Farne Island Grey Seals. (I defy any diver not to surface grinning from ear to ear after diving with these seals. It truly is special diving). This book is not just a collection of lovely images. Each story has a concise fact-panel outlining key species, hand tips for visitors, lists of equipment to take and the best time to visit. I asked Caroline Robertson-Brown what was her fondest memory from this massive photography project. "Probably the funniest and most unexpected experience we had was in the Exumas. We were photographing swimming Gloucester Old Spot pigs. It is quite a sight to sit in Bahamian blue water and have a pig swim right up to you and say hello." The launch of 'World's Best Wildlife Dive Sites' is being celebrated this Thursday (21st July 2016) at Ocean Leisure, 11 Northumberland Avenue, London, WC2N 5AQ from 18.00. If you scuba dive come along, join in the discussions and enjoy a welcome 'Bahama Mama' cocktail courtesy of the Bahamas Ministry of Tourism and wine from the South Australia Tourist Board. There will also be plenty of opportunity for you to talk to the authors and get a first edition book signed. In the event that you cannot make it to Ocean Leisure, "The World’s Best Wildlife Dive Sites" will be available from all good bookshops or via Amazon.